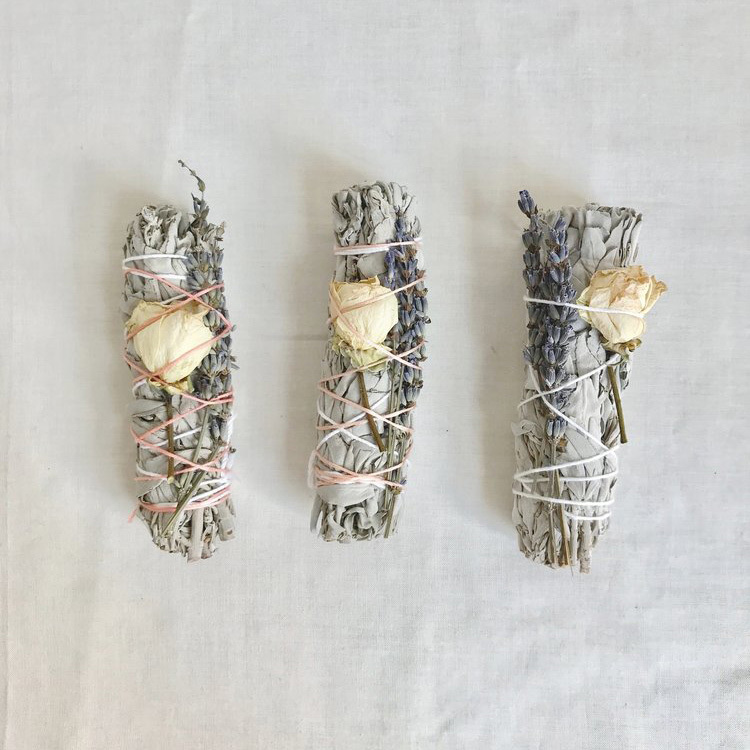 This meditatively beautiful smudge stick from Catherine Rising combines traditional sage with lavender sprigs and a single white rose. It's handtied with vintage cotton floss. Smudge sticks are used to clear spaces energetically, purifying and infusing them with positive energy. Light the smudge stick and then let the flame extinguish, allowing the smoke to do its magic as you carry the stick around the space. It's helpful to set an intention while you smudge, whether focusing on releasing negative energy or thoughts, or thinking of a feeling or desire that you would like to bring into the space. Always be vigilant to ensure that no stray sparks fall and that the stick is completely extinguished when finished. You can use a smudge stick several times.